Richard Lepkowski, the jury foreman at the Manhattan, New York court hearing the Rajat Gupta trial handed the US government its biggest success in its fight against insider trading when he read out the jury's decision before noon of Friday, June 15: Gupta, the former McKinsey & Co. Managing Partner, was guilty of securities fraud and conspiracy. Gupta, 63, is the highest-ranking executive the US government has successfully prosecuted in its four-year fight to clean up Wall Street. The former McKinsey global head was charged with passing confidential information about Goldman Sachs Group Inc. and Procter & Gamble (P&G) Inc. while serving as a director at these companies. The recipient of the information was Raj Rajaratnam, co-founder of the now defunct billion-dollar Galleon Hedge Fund LLP. Convicted of insider trading last year, Rajaratnam is serving an 11-year-prison sentence - the longest ever for this crime. Gupta, who will be sentenced on October 18, showed no emotion when the verdict was read. But behind him, his wife and four daughters, who have attended the trial every day since it began on May 21, were in tears. His eldest daughter, Geetanjali, had taken the stand as a defence witness earlier in the trial. Manhattan US Attorney Preet Bharara, who has led the US government's efforts to nail insider trading, pulled no punches after the verdict was read. "Having fallen from respected insider to convicted inside trader, Mr Gupta has now exchanged the lofty board room for the prospect of a lowly jail cell," he said in a statement. Gupta did not comment but his lawyer, Gary Naftalis, was quoted by a wire agency as saying, "We continue to feel that Mr Gupta is innocent of all charges. We will be making a motion to set aside the verdict and appeal if necessary." Such a motion, said experts, can be expected to be denied by the judge. Gupta's lawyers can then appeal the case based on alleged errors in trial. Ravi Batra, a prominent Indian-American attorney on the board of New York State's Public Ethics Commission, points out that this route can be "arduous" since the jury seems to have been thorough. For instance, the jury members came to a verdict in less than two days and acquitted Gupta on two counts, which they thought had not been proven. "The appeal is an uphill battle that will probably go nowhere," he said. Gupta, an alumnus of the Indian Institute of Technology Delhi and Harvard Business School, was found guilty of three counts of security fraud out of five and one count of conspiracy on the second day of jury deliberations. Securities fraud charges carry a sentence of a maximum of 20 years and conspiracy carries a five-year sentence. The Indian-born corporate honcho also has the option to try and get his sentence reduced. This would involve his friends and colleagues testifying to his good character. "The judges will then settle the books of the bad act and his life-long good ones," said Batra. In its arguments, the prosecution was single-aimed in establishing a pattern in the relationship between Gupta and Rajaratnam. An important development at Goldman Sachs or P&G, like quarterly earnings announcements, would be followed by a series of calls between the two, which in turn would be followed by Galleon buying or selling shares. The most contested instance was the alleged leak of the Warren Buffett-Sachs deal struck after the collapse of Lehman Brothers Holding Inc. in 2008. 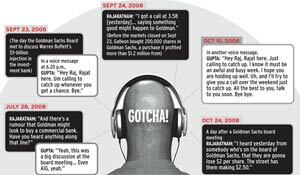 The prosecution produced phone records that showed at 3.13 p.m. on September 23 that year, Gupta called into a Goldman Sachs boardroom meeting, which discussed Buffett's Berkshire Hathaway Inc. investing $5 billion in the investment bank. Another phone record shows that Gupta called Rajaratnam at 3.54 and 3.55 p.m. The Goldman Sachs shares, which Galleon purchased at 3.56 p.m. and 3.57 p.m., yielded a profi t of more than $1.2 million and constituted 18 per cent of the Goldman Sachs shares purchased that day. The jury found Gupta guilty on two charges related to this purchase, as also on a charge around the sale of 150,000 shares of Goldman Sachs on October 24 the same year. Efforts by Gupta's counsel, led by Naftalis, to brand the prosecution's evidence as circumstantial failed. As also evidence the defence counsel presented suggesting that the two men were on bad terms in 2008 because Rajaratnam's mismanagement of their joint-fund Voyager Capital Partners cost Gupta his entire investment of $10 million. They also argued that somebody else inside Goldman Sachs was leaking secrets. A July 28, 2008 call between the two may have proved the most damaging to Gupta as it appears to have established the cosiness and comfort level of the two men. On that call, Rajaratnam says: "And there's a rumour that Goldman might look to buy a commercial bank." He also says: "Have you heard anything along that line?" "Yeah, this was a big discussion at the board meeting," Gupta says, adding that American International Group was among the names discussed. Immediately after the verdict, experts suggested that independent directors would be more cautious in what they say and do in future, but the effects of the verdict may not be long-lasting. "The general deterrent value of this round of insider trading prosecutions is limited because Wall Street has a short memory," said Harlan Protass, a criminal defence lawyer with Clayman & Rosenberg LLP in New York. But for Gupta, as defence counsel Naftalis told the jury in his closing remarks "this is the only case". One that went horribly wrong for him.